Reflections on a social justice icon. Guillermo Prado (L) and Cheryl DeYoung were among the Inkworks staff in 1995. Last month, Berkeley's Inkworks Press closed its doors after 42 years. It marked the end of a bold experiment in worker ownership and political control of the media in the service of social justice. 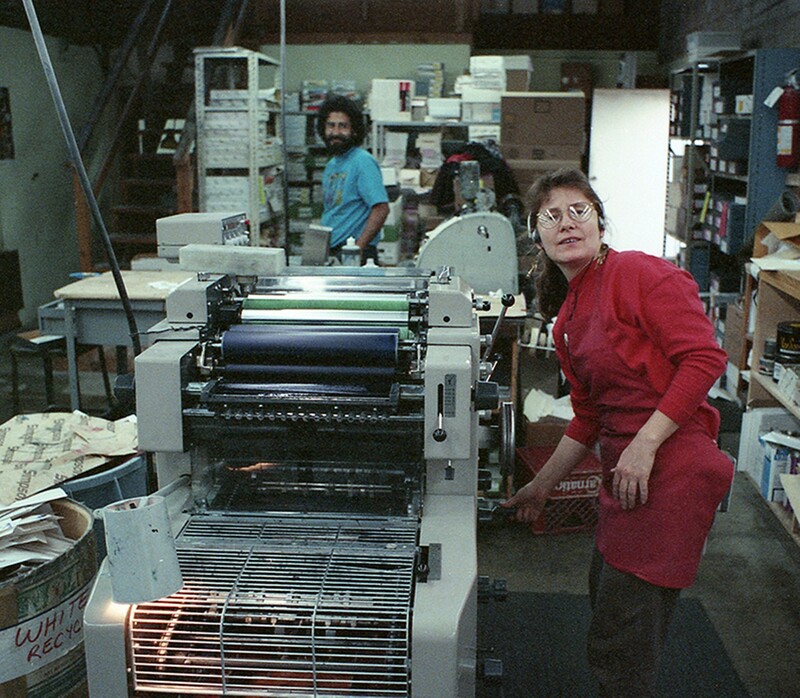 Inkworks started in 1974 when Berkeley activists who had been learning offset printing at an alternative school set up a shop. The various streams of activism — against the Vietnam War, for international solidarity, civil rights, feminism, LGBT rights — were in full bloom, and there was a deep need for community-based media facilities. This was political work that could support itself. The shop would be self-sufficient, blending commercial and political work and charging on a sliding scale. The shop became a nonprofit (though not tax-exempt) corporation with a collective structure in which everyone owned it together. It was a source of employment for women and people of color in a white-male-dominated trade. Inkworks remained steadfastly independent of any party or political grouping (and there were many contenders in the late 1970s and early 1980s). To establish reasonable working conditions and align with the labor movement, Inkworks became a union shop (International Printing and Graphic Communications Union, now part of the Teamsters) in 1978. Yet in a defiant resistance to conformity, everyone was paid the same hourly wage. In this age of effortless blogging and web streaming, it's hard to understand how difficult it was to publish political content in the mid-1970s. If you wanted to announce a benefit concert for Chile, or rally citizens around an antiwar demonstration, or issue a report on corporate environmental pollution, you had few choices. In many cities, there was often a public access radio station, such as Berkeley's KPFA, and if you were lucky, there were one or two alternative newspapers that might carry such information. But a third, powerful, channel was that of printed documents such as posters, fliers, and handbills. That required a sympathetic print shop. The iconoclastic American journalist A.J. Liebling wrote, "Freedom of the press is guaranteed only to those who own one." He meant newspapers, but those of us in the energetic political movements of the late 1960s and early 1970s knew it also meant offset printing. Learning to print was a political act. Other such pioneers of the New Left included David Lance Goines' small shop for Berkeley's Free Speech Movement in 1964; Glad Day Press in Ithaca, New York and Peace Press in Los Angeles (1967); and Chicago's Salsedo Press and Red Sun in the Boston area (1973). Of those, only Salsedo and Red Sun remain. But other shops, such as Brooklyn's Radix Media, continue this noble trade. And the graphic design department of Inkworks, which spun off in 2002, is now the Design Action Collective, a very successful visual communications business in Oakland. As a young printer and activist in conservative San Diego, I always made a pilgrimage to Inkworks whenever I visited the Bay Area. The shop represented proletarian heaven to me — a union outfit that was collectively-owned and operated, serving a vibrant and diverse community. They had big presses, cool posters, and political authenticity as thick as printer's ink. I joined in 1981 as a small press operator and left in 2001 as an estimator. My young children would delight in seeing our union "bug" on incoming mail. To this day, I still meet people who remember me taking in their job across the counter. It was — is — a community. Inkworks was such a huge part of my life that I still refer to it as if I work there. 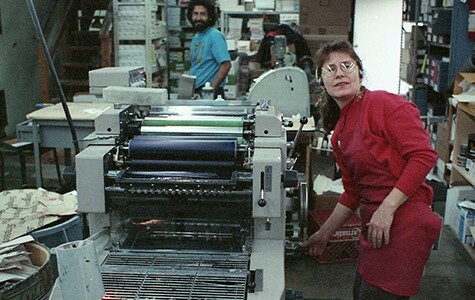 As one of the preeminent movement print shops in the United States, Inkworks would regularly host visitors from all over the world — El Salvador and Vietnam, South Africa and Cuba. We sent material aid to Nicaragua and printed campaign materials for Haiti. We hosted conferences for the Progressive Printers Network, a support group for similar shops in the United States and Canada. One of those shops, the cooperatively owned Community Printers of Santa Cruz, has since established a strong link with the Bay Area and has been designated as our recommended successor for our clients. Inkworks has unquestionably been an eight-hundred-pound gorilla of social justice publication. The monthly East Bay Community Calendar was a stylish and insightful broadsheet published in editions of 7,500 between 1976 and 1979. Inkworks printed thousands of stunning posters on subjects such as ending South African apartheid, San Francisco Mime Troupe performances, support for gay and women's liberation, and opposition to racist ballot initiatives. Many of these posters are reproduced in our acclaimed 2007 book Visions of Peace & Justice: 30 years of political posters from Inkworks Press; a 2016 addendum is now being issued. Inkworks made the painful decision to close down as a consequence of the recession in the 2000s, a general shakeout in the printing industry, and an aging collective membership that deserved to retire. Graciously, another beloved Bay Area collective — the Cheese Board — helped Inkworks by buying their building at 2827 Seventh Street and leasing it back to Inkworks at an affordable rate. So what is Inkworks' legacy? It offered proof that economically sustainable political work was possible. It was a test bed for alternative ways of working, of practical group decision-making, of offering a service that genuinely met community needs. It was midwife for a wealth of publications that document the energy and passion of more than forty years of social change. It was a safe haven for hundreds of publishing activists. It was a giant in movement printing history. Inkworks Press — and the extended collective that ran it — is no more. The loss of the Blue Angels due to federal budget cuts gives us the chance to steer the annual event away from being just a homage to the Navy.